Surely he means thinking about it first? Figure 1. 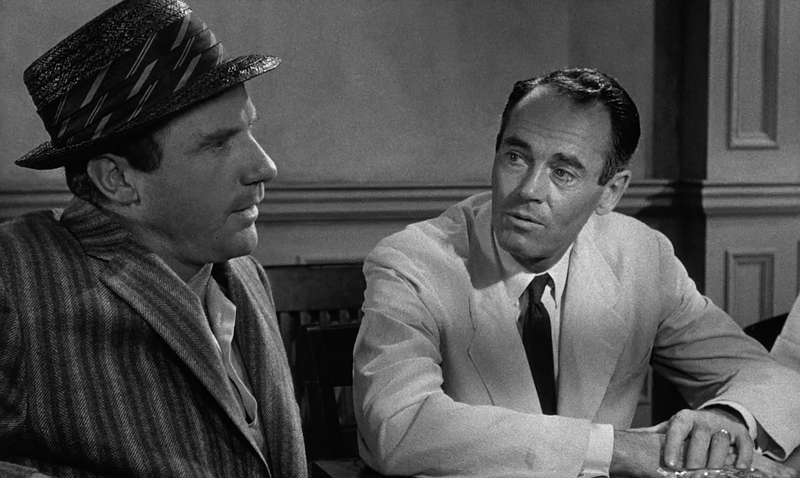 Juror #8, played by Henry Fonda (right), calmly lays out his doubt to another juror. 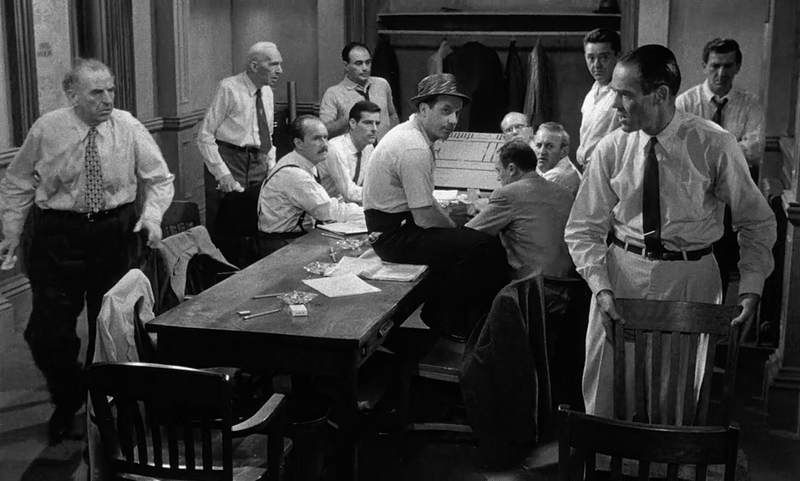 Juror #8, played by Henry Fonda (figure 1), and whose name is revealed as Davis at the end of the film, is an architect. As the action of the film develops, he shows how he thinks differently from the others, questioning what they take to be true, and introducing a doubt that he slowly convinces them is reasonable. “I’m just saying a coincidence is possible”, juror #8 replies, before taking a very similar ‘unique’ weapon from his pocket and sticking it into the table, to the others’ astonishment. During the trial he’d been to the neighbourhood where the murder had happened and managed easily to buy the knife. The practical way in which juror #8 deconstructs the others’ arguments reveals a person who is able to imagine and interrogate alternative scenarios to fit the facts. This is a kind of creative reasoning that is called abduction, a design reasoning skill vital to the design process, and a way of thinking that an architect would be trained in . 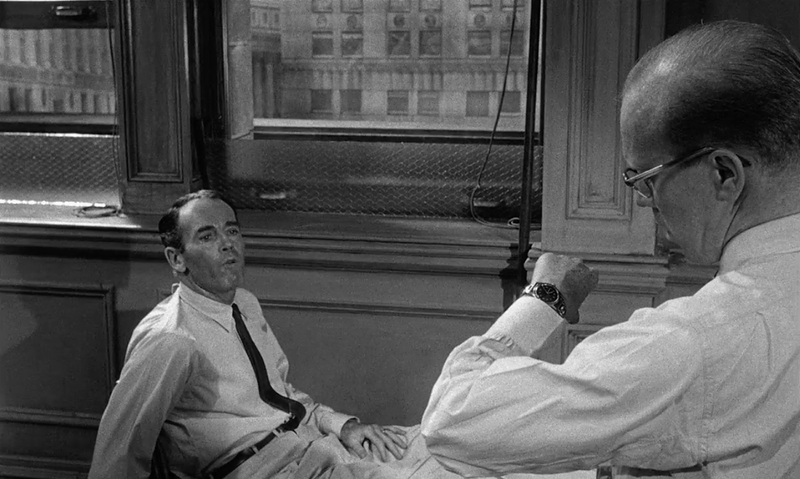 Another example of design thinking occurs later in the film, when juror number #8, questions whether a key witness to the murder – an old man lying in bed in the flat below – would be able to get to his front door to identify the boy in under 15 seconds. Juror #8 calls for the plan of the flat used in court (figure 2) and is able to translate the dimensions of the bedroom and corridor into a rough prototype in the jury room (figure 3). Figure 2. Juror #8 explains to the other jurors why he thinks a key witness couldn’t have got from his bed to his front door in 15 seconds. Figure 3. 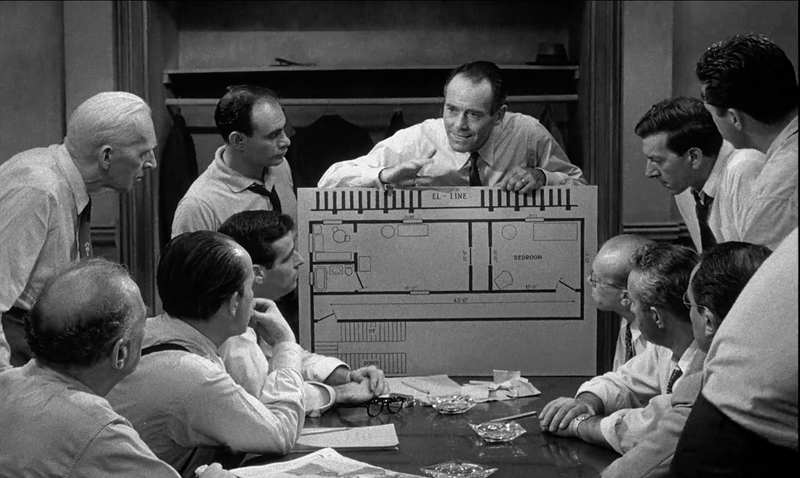 Juror #8 arranges the room to simulate the layout of the old man’s flat. As he models and performs what the old man would have gone through, juror #8 asks another juror to time him. Juror #8 asks another juror to time him while he simulates getting from the bed to the front door. Taking the action away from the ‘theoretical’ discussion at the table – a move from ‘talking about it’ to ‘thinking about it’ – allows juror #8 to produce a prototype, physically testing his conjecture that the old man couldn’t have got from his bed to his front door in 15 seconds. This test of practical thinking wins over another couple of sceptical jurors. Davis displays design thinking in a legal context, overturning an eleven-to-one minority into a twelve-to-zero majority. As an architect, he is used to mapping the words that he hears to the spaces around him and it is the exploration of spatial, artefactual, and environmental possibility in the crime that reasons the other jurors into doubt. It is the kind of thinking – we could also call it a kind of moral imagination – that saves the boy’s life. In the film Davis is one out of twelve (white, male) individuals but currently in the UK architects make up only one out of every 2000 people . Perhaps we could do with a few more for our collective moral imagination, especially in the legal profession, in these uncertain, divided times. ‘Abduction’ is a type of reasoning identified by the pragmatist philosopher C.S. Peirce, who contrasted it with deduction and induction, as a way of reaching a conclusion from premises. He used it to try and show a logic to the process of creative discovery and creative explanation. Architects Council of Europe (2015) The Architectural Profession in Europe 2014 (pdf), p.10.